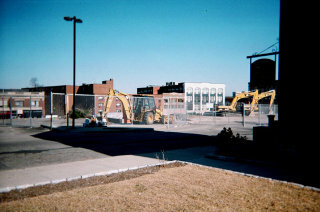 The old bus station is demolished and the groundwork preparation is underway for the courthouse to come on 2009. The site will occupy what was the location of Hall’s Livery, the Bowen and Miller house, and a considerable chunk of real estate on the west end of the lot facing South Main. This view is from the south lawn of #92 Second Street. The buildings in the background are on South Main Street, where the Andrew J. Borden building is still located and where Lizzie’s shoplifting tendencies found fertile possibilities in department stores such as McWhirr’s. As of July 25th, the lot is still a large gravel pit with no signs of activity for the next stage of construction.